Many people are baffled by the devotion of the Brits to their tea. This is not surprising if all you've ever had is a grey/brown insipid cup of liquid muck. But once you learn how to make tea properly, you may begin to see the magic. You can make tea in a teapot or in a mug. 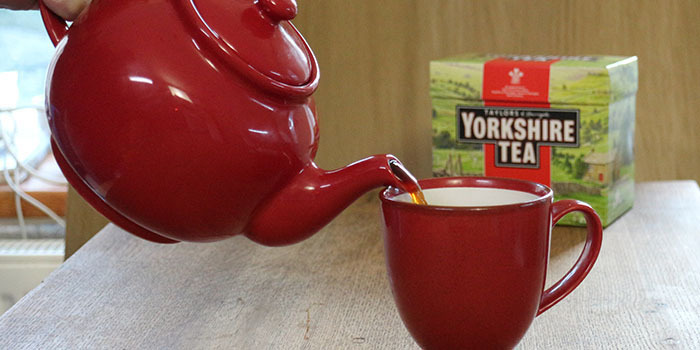 If using a pot, you'll need one teabag per person, plus an extra one ('for the pot' - don't ask). If using a mug, place one teabag in it. Bring some water to the boil. If you don't have a kettle, use a saucepan. Don't try to boil water in the microwave. If you are using a teapot, you will first need to warm the pot. When the water has boiled, pour some into the pot, swirl it round a few times, then pour it away. Bring the water back to the boil, add your teabags and add the boiling water. Put the lid on the teapot. If you're in a cold country and have a tea-cosy, put that onto the pot to keep the tea hot. If you are making your tea in a mug or cup, fill it with boiling water. The water must be boiling when it hits the tea bag. The tea needs to stand for 3-4 minutes to infuse properly. Do not add milk until the tea has brewed - once you add milk, it stops the infusion process. Using the mug method, remove the teabag when the tea has brewed. Add milk and sugar to taste. Some like to add a slice of lemon instead of milk. I don't find that pleasant at all. Using the teapot method, add a little milk to the cup and pour tea over it. Or part fill the cup with tea and add milk. The order of doing this is somewhat contentious, but I don't actually think it makes any difference. And that's it. Proper tea! The video above is from the Keef Cooks YouTube channel. Click here to see the video recipe of How to Make Tea on YouTube. Milk and sugar to taste. Prep time: 1 minute. brewing time: 4 minutes.